Southwestern Utah's mini-Yosemite in the desert. 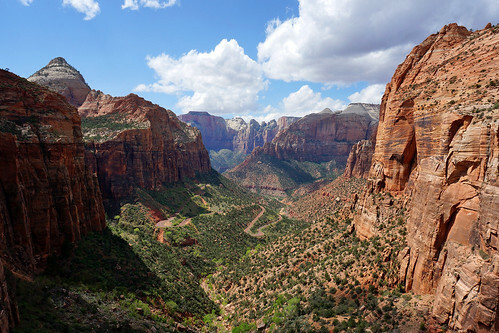 This is actually Pine Creek Canyon, which intersects with Zion Canyon, running from left to right in the background. In the canyon below is the Zion-Mt. Carmel Highway, and just inside the cliff wall at left, following the wall, is the 1.1-mile Zion Tunnel, built between 1927 and 1930 and lit only by "galleries" or windows carved out of the wall.